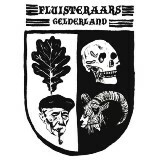 Dutch Fluisteraars (Whisperers) may have struck fame with Luwte, but Gelderland is a 2-track EP showcasing the trio closer to the earlier rawer black metal origins. Even with that Fluisteraars cannot help themselves but to roam somewhere between more direct and outwardly epic black metal structures, creating a strange sense of duality. Zijsselt opens with fast blasting, and strikes all kinds of soul chords, confusion, anxiety, even joy. This track is a rush to nowhere. It is like fast moving waters, running over the shallow protruding stones, then suddenly hitting placid area, i.e. the acoustic break, after which calm vastness opens. So, where did we run to then? Stuk is more Fluisteraars of the recent. Placed somewhere between urban and woodsy, the track has both angliness and grinding, yet there are glimpses of fleeting beauty, although dredging in the unsatisfying muck wins in the end. Gelderland may be short, but it sure is expressive, and I love releases like that, where you don’t need 10 tracks to showcase the whole character.